Click here to visit the American Family site and register a new account with them. 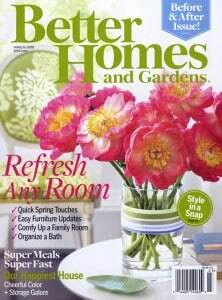 The first 15,000 people to do so will get a free One Year Subscription To Better Homes & Garden Magazine. Please note that after you register, it’ll show you about 5-6 offers. Just click “Skip” on them. Send me the magazine.. TY. I like the gardening articles! I would so love a subscription to their magazine. It would be a lovely treat!!! I can’t wait to get the magazine! Thanks! Awesome magazine……..love the ideas. And articles……. I love Better Homes and Gardens.. So much to enjoy reading.